ORLANDO, Fla. – SeaWorld Orlando and the Miami Dolphins have announced a multi-year marketing agreement. “SeaWorld, Where the Dolphins Play!” is the tagline for the integrated campaign involving a season-long sweepstakes and special deals for Florida residents. 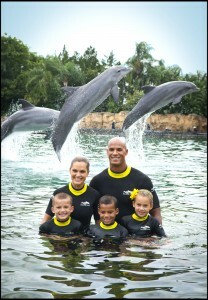 SeaWorld Football Family of the Year is a sweepstakes that kicked off on September 21 and will continue through December 31. Fans can register at Dolphins.com/SeaWorld to win a grand prize three-day, two-night SeaWorld and Aquatica weekend getaway plus four tickets to all 2013 regular season Miami Dolphins home games. The Game Day Advantage offers Florida resident deals at SeaWorld for Miami Dolphins fans and will be featured in radio, digital and TV throughout key Florida markets as well as in-stadium. “Aligning with the Miami Dolphins is a natural fit. We both share the same commitment to family and tradition and are great places to make lifetime memories,” said Vice President of Marketing Toni Caracciolo. “We’re thrilled to have Jason Taylor involved because he’s devoted to family, a world-class athlete and loved by so many fans”. SeaWorld Orlando immerses guests in the sea’s mysteries through up-close animal discoveries, amazing attractions, thrilling rides and unforgettable performances. Whether riding Manta, getting drenched by Shamu, or feeding seals and sea lions, vacation adventures become lifelong memories at SeaWorld. All new is TurtleTrek, a unique blend of up-close animal encounters with manatees and turtles and state-of-the art entertainment with the world’s first 3D/360 dome theater film. Coming to SeaWorld Orlando in spring 2013 is Antarctica – Empire of the Penguin, the biggest and most expansive attraction in SeaWorld’s history. This epic exploration of a mysterious world blends animal encounters with an exhilarating ride for a one-of-a-kind experience the whole family will enjoy. Be transported to an icy world you’ve never seen before. Experience the majestic grandeur of the South Pole and see it through the penguins’ eyes on an exhilarating first-of-its kind family ride. Then, step out and explore their colony in an expanse that envelops you in cool extremes: bringing you above and below their icy world.